One of my jobs is working part time at Colby College in the Career Center and the Director loaned me this book because David is a Colby alumni and she had recently met him. Curious, I began reading it when I was covering “drop-in” hours and was hooked immediately. I finished it over the weekend, great stuff! 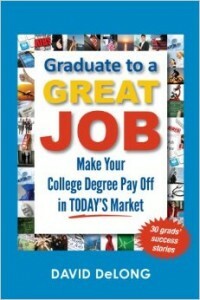 This is a book written to college students and their parents and is filled with practical advice on a range of job seeking topics from networking (which is obviously the key piece), the importance of internships, tips on writing a strong resume, interviewing, attitude, and the parents role (one chapter devoted to what parents should and should not do). He also recommends getting into the College Career Center and getting as much as you can out of it while the student is there. At the end of each chapter there is a “Checklist for Action” with specific action steps to take related to the chapter. Regardless of the chapter, I found the check list to be filled with a number of specific action steps a student could choose from to improve their job seeking skills. He addresses the importance of networking and having a strong resume, writing a concise & clear email to secure informational interviews, developing a professional online presence using LinkedIn, and most importantly DOING lots of informational interviews. “Facetime is primetime” was one of my favorite quotes. This job seeking is going to happen because of facetime with someone, NOT because you email 1000’s of people or upload your resume to 1000’s of companies websites. I learned quite a bit about ATS, Applicant Tracking Systems, which will help me with advising students & clients who apply to any of the larger company using ATS. I knew keywords were important but with a company using an ATS system it is critical. One tip he gave was brilliant to find keywords (I wish I had thought of it). Copy and past the mission statement from a company and / or the job description you are applying to into a Word Cloud like wordle.net or tagword.com to visibly SEE the keywords the company uses. Then incorporate them into your resume, cover letter, LinkedIn profile, and interview. His LinkedIn section looked like it was taken from my LinkedIn workshop I do at Colby College. This felt like a book I could have written as I agreed with so much of his advice and appreciated so many of his tips. RECOMMENDATION: If you work at a college or have a college age son / daughter, this is a must read.